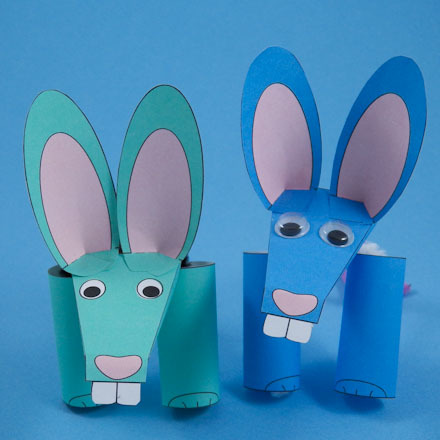 Make finger puppets whose legs are moved with two fingers and the head with another finger. The craft project includes printable patterns for three animal puppets: lion, rabbit and bighorn sheep. You can make up stories and put on plays with these puppets! 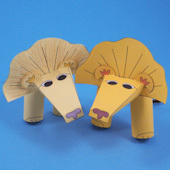 This craft project is part of a series of puppet-making projects that includes plays based on folktales and fables from cultures around the world and from previous times. 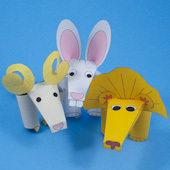 An ancient Greek fable is the basis for a play, The Lion and the Rabbit, using puppets in this project. Related craft: For more finger puppets, see the Triceratops Finger Puppets, Elephant Finger Puppets, Paper Cone Finger Puppets and Toilet Paper Tube Puppets projects, and for other puppets with plays based on folktales, see Puppets Around the World. Choose the puppets that you want to make. Each pattern includes the puppet in two colors. Download the pattern and print it on white paper. 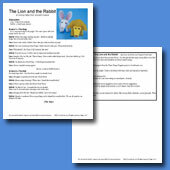 For the puppet play, The Lion and the Rabbit, make the Lion and Rabbit puppets. If you printed the plain patterns, draw eyes, ears, nose and toes, then color the puppets any colors you like. Lions are usually tan or yellow. Rabbits come in many colors—white, gray, brown, black. Bighorn sheep are white, gray, or black. Some are white with a black face. You might color the lion and the rabbit with short lines that look like fur. Color the sheep with curls that look like wool. Put tufts of fur in the ears. Tip: Instead of drawing eyes, you can glue on googly eyes. 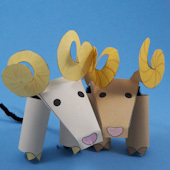 Tip: Color both sides of the horns for the bighorn sheep. Cut out each puppet part on the outside black line. Each puppet has a head, two legs and an additional feature. For the lion, also cut out a mane. For a rabbit, cut out two ears. For the bighorn sheep, cut out two horns. For the lion and bighorn sheep, snip the outer half of each ear away from the head. Tip: It's easier to cut out the puppet parts if you first cut the pattern into pieces with simple straight cuts, then cut out each part on its black outline. Each leg will be formed into a tube. One leg will slide onto your index finger. The other goes on your ring finger. The legs need to fit your fingers. Wrap the leg around your finger to see how much overlap is needed, then glue. Put glue on the back of the leg along one of the short sides. Form a tube and press along the glued edge. Tip: You may find it easier to use tape. Wrap the leg around your finger and tape it while it is on your finger. There are four lines that run from the nose to the top of the head. Make a mountain fold on each of these lines. Fold the nose down on each puppet. On the lion and the bighorn sheep, fold the ears up. Tip: You can use tape in place of the glue. Put glue along the back of one of the folded edges. Form the head shape and press the two bottom edges together. Rabbit: Fold the nose and teeth down. Fold the glue tab up on each ear and cut each tab in half on the center line. Glue the tab halves together—one on top of the other. Glue each ear to the head. Bighorn sheep: Fold the nose down and the ears up. Cut the spiral on each horn. Put glue on the base of each horn. Glue the horns inside the head below the ears. Lion: Fold the nose down and the ears up. Cut the sides of the glue tab on the mane. Fold the glue tab up and put glue on it. Glue it inside the head with the tab. Tip: You can give the horns and mane more shape by curling them over a pencil with your fingers. Tip: Your puppets can have four legs. Just make leg coverings for your thumb and little finger. Now you can have your puppets walk on four legs. Bring your puppet to life by putting the head on your middle finger. Put one leg on your index finger, and put the other leg on your ring finger. Now make your puppet walk by moving your fingers. Tip: If the head won't stay on your finger, stuff some tissue around your finger. Tip: If you want to hide your hand, put on a glove or drape a cloth over your hand. Try to use colors that match the puppet. Think of what your puppets will do. Where does your play take place? Write down what the puppets will say and figure out how they will move. Will more than two puppets be on stage at once? Do you need a friend to help? Rehearse your play a few times, and then perform it for family and friends. That's it! You are ready to put on a play! Puppet Play: An Aesop fable from ancient Greece is the basis for the play, The Lion and the Rabbit, performed with puppets from this project. Tip: Each puppet pattern has puppets in two different colors—make one or both. 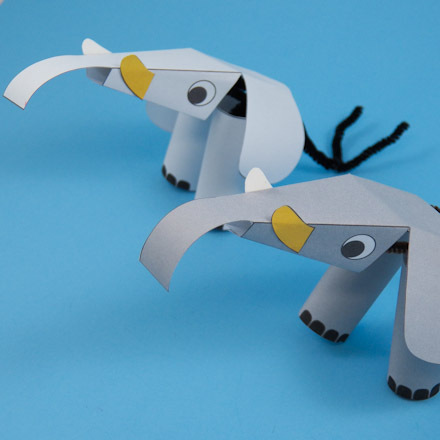 Tip: You can make the puppets any way you like—fanciful colors or glued-on googly eyes. For these colorful puppets, the puppet pattern's PDF file was opened in Inkscape (a free drawing program) and the colors were changed. 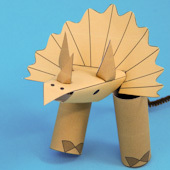 Tip: For three-finger puppets made in a similar way, checkout the Elephant Finger Puppets and Triceratops Finger Puppets craft projects.